The building had an upper floor for the liturgy and a lower one that housed the nuns who offered medical visits and medicines to the population of the very poor area. The parish community is composed of 2 thousand faithful. Motive for destruction uncertain. 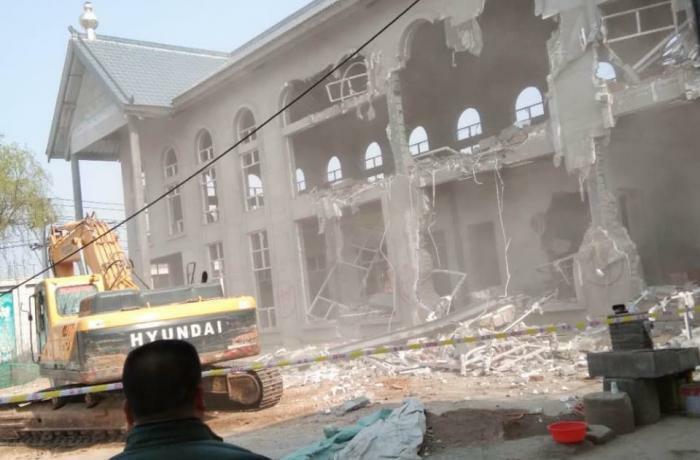 Rome (AsiaNews) - This morning, the Qianyang (Shaanxi) government razed the only parish in the city to the ground. A bulldozer reduced the two-story building to rubble under the supervision of a group of policemen. In the video sent to AsiaNews we hear the sobs of some women, while several faithful look astonished at the destruction. The Qianyang parish was located in a very poor area of ​​Shaanxi and gathers around 2 thousand Catholics, all peasants. It was built with offerings from other communities in the diocese. On the upper floor the building housed the liturgy room; on the ground floor there were offices and the nuns residence. The sisters offered medical aid, medical visits and medicines to the indigent population. The reasons for the destruction are still not known clearly. The Diocese of Fengxiang, led until 2017 by Msgr. Luke Li Jingfeng has a special character in the Chinese church scene: it is the only diocese where neither the faithful nor the bishop are members of the Patriotic Association, although there is an Office for Religious Affairs. From 2017, the bishop has been 54 years old Msgr. Peter Li Huiyuan. Some observers think that violence against the parish is a way to force the diocese to apply the new religious regulations and to have bishops and priests enrolled in the Patriotic Association. Others point out that the communist cell that presides over the Qianyang government is made up of radical Maoists, for whom "religion is a fantasy that must be eradicated". The church of Qianyang is famous in the area: in the past, according to the faithful, some miracles have been attributed to the holy water in the parish. Since then, many have flocked to receive holy water that is used as a physical and spiritual remedy for humans and animals. For some believers, the destruction is due to the Maoists "fear of holy water". What else would you expect when the deal with the devil has been made. He wants this diocese too. When did this news actually happened? A deal between the Pope and the communist government in China set up by disgraced ex-cardinal McCarrick that gives the government power to make their own bishops. The underground real RCC is now being eliminated by the government. You must have your head stuck really far down in the sand to have missed this. Start reading and join reality. Moons, It was a good and fair question. The Pope is not responsible for McCarrick actions, however I agree he never should have signed off on the deal. . While your answer is good, as Christians consider supporting/informing each other with love and respect, not with disparaging comments. We all have different lives, different amounts of free time, and different access to good information. The pope shares responsibility because he signed off on a deal with the atheist Chinese communist government in which the state run patriotic Catholic Church becomes recognized as valid and the government gets to choose its bishops. Meanwhile the long suffering legitimate and faithful Catholic Church in China is told you’ve been martyred and sit in prison all these years for no reason despite the fact that all previous popes excommunicated the bishops in the state run church and deemed it invalid. It’s a slap in the face to the true Catholics in China. Not only did he imply their suffering has been in vane, but he didn’t even address them in his deal with the Chinese government. Now the Chinese government can do this to the legitimate church, which this was, with the pope’s approval because suddenly the legitimate church became the schismatic Church literally overnight. So many people, also in my family, and under my friends, refuse to read about these things, but instead accuse me of complot-thinking... Which actually is true, since these are the complots of Satan! Last standing evil on earth communist China. Dont buy made in China!!! If can defeat communist only when we hold together. If you are buying Chinese goods that means your are indirectly supporting communist China. Progressive? Tearing down a church housing Christians dedicated to assisting the poor of the area is not Progress! Very sad as I have met so many Chinese Christians who are suppressed by Communist government. Please pray for God's help to enlighten the minds of men whose hearts are hardened against the less fortunate among us. Lord keep our Faith remain strong in YOU regardless of the challenges we face, through Christ our Lord. Amen.